The article first appeared at American Lens News on August 17, 2017. With four more arrests this morning, the Durham statue arrests now total 8. According to the Durham Sheriff, the arrests related to the destruction of the Durham statue were made at a demonstration this morning. Around 100 progressive liberal activists gathered outside the Durham County courthouse on Dillard Street around 8 a.m. and walked down to the jail to support those already charged. This morning’s demonstration was promoted last night by email by the far left group, Triangle SURJ (Standing Up For Racial Justice). The group put out an email calling for “white folks with clean records” to show up and possibly be arrested. From the Durham Sheriff’s press release, those arrests were Aaron Alexander Caldwell (24), Raul Mauro Arce Jimenez (26) and Elena Everett (37). The charges are slightly different from those previously arrested. According to media reports, all four had warrants for their arrest and turned themselves in. 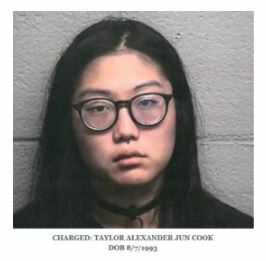 One other protester, Taylor Alexander Jun Cook (24) was the fourth person to turn themselves in. “The Sheriff’s Office is aware of at least one other person expected to surrender today. The Sheriff’s Office consulted with the Durham County District Attorney’s Office on two occasions before obtaining arrest warrants for all seven suspects. One other person present appeared to take credit for pulling the Durham statue down. D’Atra Jackson tweeted out that she was the one who pulled down the Durham statue. Durham Herald Sun captured comments by the attorney representing the protesters, Scott Holmes of the NCCU school of law. Holmes wanted to “correct” the Durham Sheriff about the Durham statue arrests. Holmes claims there was no violence or incitement of a riot. Holmes acknowledged there “might be” vandalism. Elena Everett is documented as being affiliated with a number of radical groups in the state, including the Communist World Workers Party, Blueprint NC, Institute for Southern Studies, Fair Vote NC and the Southern Coalition for Social Justice. As previously reported, Everett is the registered agent behind a charitable organization with lapsed status called Action for Community in Raleigh (ACRe). Everett is also a point of contact for two sub-organizations of ACRe called the Durham Solidarity Center and the Youth Organizing Institute. Another offshoot of ACRe is the Southern Vision Alliance. Southern Vision Alliance sent out a call on Monday to raise ‘legal defense funds’ for Takiyah Thompson and the others arrested over the last few days. Despite the lapsed charity status, ACRe’s offshoots, like Southern Vision Alliance, continue to solicit money, arguably illegally. ACRe has many other offshoots such as Ignite NC, NC Heat, and Wake Youth Organizing Institute. A list of the ‘non-profits’ that all track back to ACRe is below. 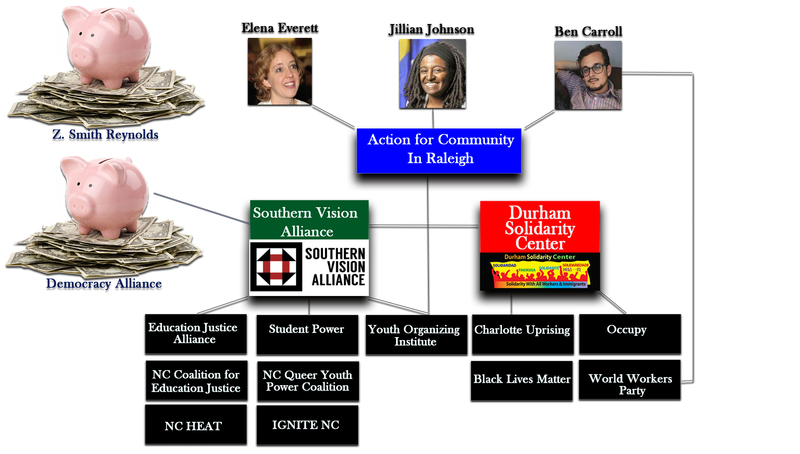 The registered agent for both Southern Vision Alliance and Durham Solidarity Center websites is Durham Councilwoman Jillian Johnson. Southern Vision Alliance and Loan Tran, Director of the Youth Organizing Institute and organizer with World Workers Party, were mentioned in a November 2016 meeting agenda of the George Soro backed Democracy Alliance. Raul Jimenez is a member of the Triangle May Day Unity Coalition, which is yet another partner of Durham Solidarity Center. Triangle May Day’s purpose is a smorgasbord of far left and liberal causes, including supporting unions, minimum wage campaigns, a range of LGBT issues and fighting ICE raids and deportation of illegal aliens. Earlier this year, Jimenez and Triangle May Day illegally and dangerously blocked traffic in Durham and harassed drivers trying to pass. Alleged ‘safety marshals’ for the group were caught on camera actively blocking a truck, which eventually forced its way through and sped off.